Jewelry: 1910 - 1939 Art Deco. 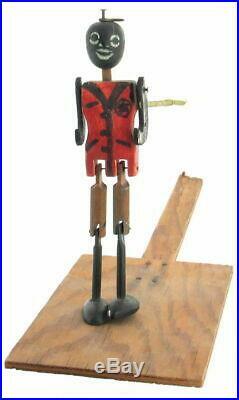 Antique Folk Art Minstrel Dancing Jig Doll Toy Black Americana Wood w Platform. 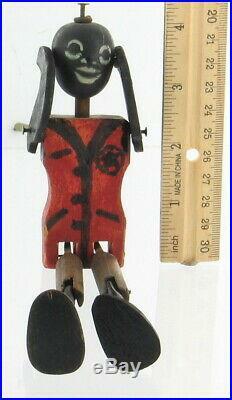 Offered here is an antique, African-American hand carved and painted folk art dancing jig toy doll minstrel. The wood platform would be held on a persons knee and holding the dancing figure in the other hand, place its feet on the platform and bounce the knee up and down to have it do its thing. In very nice condition for its age with one nail, holding an arm on, replaced with a new one. 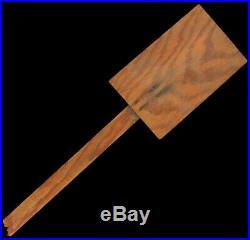 Measures approximately: 16 1/2" (length - includes handle) x 8 1/2" (height - doll) x 2 (width - doll). The platform is 19 " long, 5" wide (stage) and 1/2 thick. 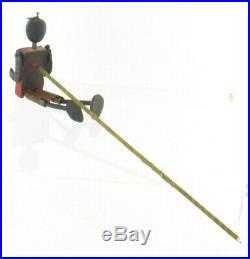 The item "Antique Folk Art Minstrel Dancing Jig Doll Toy Black Americana Wood w Platform" is in sale since Tuesday, October 16, 2018. This item is in the category "Art\Folk Art & Indigenous Art". The seller is "ellisantique" and is located in Collingswood, New Jersey.